So-called ethnic differences in the efficacy and safety of drugs have been a major hindrance for the mutual acceptance of foreign clinical data. The Japanese Ministry of Health and Welfare therefore analysed pharmacokinetic parameters for the same medicines approved in different countries, in order to assess genetic influences on drug metabolism. The results obtained from comparing mean values for different populations suggest that so-called ethnic differences might be influenced by environmental rather than genetic factors. 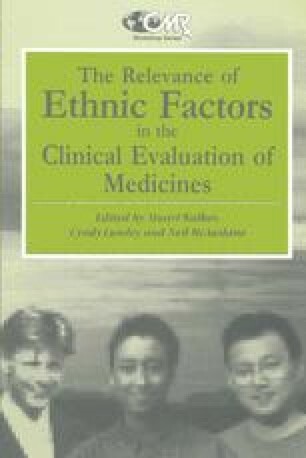 However, examination of mean data may be inappropriate to elucidate ethnic profiles of drug metabolism, and individual pharmacokinetic data have also been assessed. Although the data are limited at present, the inter-ethnic differences do not seem to be larger than the intra-ethnic variations. These results suggest that foreign pharmacokinetic data from Phase I studies, if performed properly, could be utilised mutually irrespective of the differences in race.